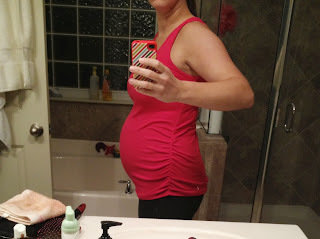 I was looking back at the blog earlier today and realized that I started these updates at 11 weeks with Lilly, so I am already a few weeks behind. Bad Mama, sorry baby! I’ll just have to try to be diligent about doing them every week from now on! Gosh, how are we already into the second trimester? Time is flying. Let’s get to it. Size of Baby B 2.0: We really need to come up with a new pet name for this one, because “Baby Baum 2.0” is kind of long. 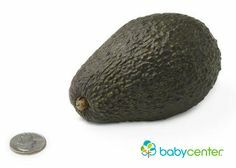 Anyway, this week baby is the size of an avocado. Apparently, he/she weighs about 3.5 ounces and is about 4.5 inches in length from head to bottom. That image is way more graphic than I originally thought, ha. Anyway, baby is apparently about to go through a growth spurt – he/she will double his/her weight and add inches to his/her length over the next few weeks. He/she already seems pretty big to me based on bump-size, oy! Weight Gain So Far: Somewhere between 3-4 lbs, so let's say 3.5. Yet again, I was feeling good about that until I realized that with Lilly I had only gained 1 lb at 16 weeks. I am trying not to dwell on it as I eat some candy. Cravings: I really haven’t had any. In fact, I don’t feel like I am nearly as hungry as I was the first time around. I have eaten my share of Lucky Charms, though, which Lilly now calls “Mommy’s cereal” and requests every morning for breakfast. When I asked her what she wanted for breakfast yesterday she walked straight over to the open pantry, pointed to the box and said, “Mommy’s cereal, please!” I think I preferred it when she wanted Oatmeal Squares, ha! Aversions: I really haven’t had any at all that I can think of. I didn’t really with Lilly, either. Maybe that means another girl? Symptoms: Acne comes and goes. Peeing a lot. Constipation (again UGH). Serious exhaustion (I’ve said it before, but I can’t believe I thought I was tired the first time around, this time it’s no joke!). 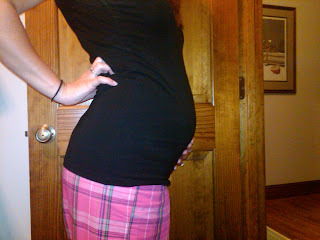 Ginormous belly (already). Oh and also my toothbrush makes me gag. Seriously. Every night. Movement: I couldn’t remember when Lilly started moving, and since it had been 4 weeks between doctor’s visits, I got a little nervous last week that I haven’t felt much of anything yet. Here and there I have felt some flutters, but nothing crazy. The doctor, of course, said it’s totally normal and not to worry one bit. Hooray! What I Miss: I can’t think of anything for this one either! Maybe Diet Coke, although admittedly I have had a few days this time around where I had to drink it. I try not to, though, unless I am just really struggling that day, because it gives me a headache. I haven’t missed beer yet but I’m sure that will change when the seasonal/pumpkin beers start coming out! Signs of a Bump: Ah yes. Doctor’s Appointment Update: Baby and I saw Dr. R yesterday, and everything is peachy. My BP was normal, and so far we’re still on track with it being lower this pregnancy than last. Fingers crossed that trend continues. She told me that the bloodwork from the first part of my First Trimester Screening came back perfectly normal, so that was exciting – and I had more blood drawn for part two of that test (neural tube defects). I got to hear the heartbeat, which was normal and healthy, although she didn’t give me a number so I can’t google and obsess about what gender it points towards. I also can’t remember whether I’ve mentioned before that I have not been taking a pre-natal vitamin – Dr. T told me at my first appointment not to take one until my constipation situation worked itself out. Suffice it to say, nothing has been worked out, so I’ve continued not to take it. I asked Dr. R whether it was okay to still be doing this, and she said it was fine. She recommended that I try a kids vitamin instead of a pre-natal – she told me they don’t have as many nutrients, but they’re better than nothing. So we’ll see! Next Doctor Appointment: September 9 we get to go in for just an ultrasound to determine gender! I'm SO excited that they're letting us do that at 18 weeks instead of making us wait until 20. I still haven’t decided whether Dan and I will just find out at the doctor or wait and somehow include Lilly, but I’m so excited. The appointment is first thing in the morning so I’m not sure I’ll be able to make it all day without peeking. Then I have another appointment scheduled for September 23 – just a normal, boring old check in with the doctor. So far, so good! Let the countdown to the gender reveal begin. Wahoo! I heard that using a kids toothpaste can help with the gagging since it is much less foamy! Good luck! Thanks for the advice, I need to give it a try! Gagging is the worst, especially when you're trying to do something sanitary like brush your teeth, ha! Have you tried the gummy prenatals? The pills gave me HORRIBLE constipation but the gummy version is easier to take with no side effects, for me at least. Can't believe it's already time to find out gender!! I haven't gotten anything new yet, but gummies are a good idea. I will pick some up next time I go to the store. Thanks for the suggestion! And time is flying for sure.